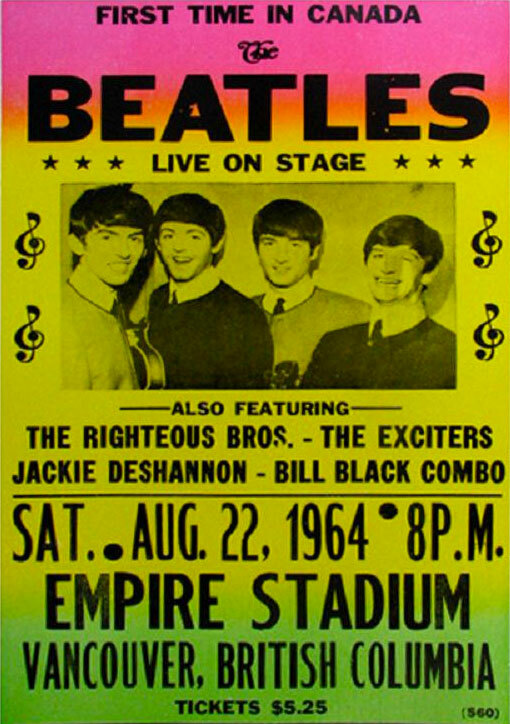 The Beatles' first Canadian concert took place in front of 20,261 fans at the Empire Stadium in Vancouver. The show began at 8.15pm and The Beatles took to the stage at 9.25pm. The support acts were, in order of appearance, The Bill Black Combo, the Exciters, The Righteous Brothers and Jackie DeShannon. The Beatles performed an 11-song set, for some reason choosing not to play I Want To Hold Your Hand. They sang Twist And Shout, You Can't Do That, All My Loving, She Loves You, Things We Said Today, Roll Over Beethoven, Can't Buy Me Love, If I Fell, Boys, A Hard Day's Night and Long Tall Sally. The group's performance was broadcast live by local radio station CKNW. After their performance they ran from the stage to their waiting limousine and were driven from the stadium, accompanied by motorcycle outriders, less than a minute after they stopped playing. The Beatles were taken straight to Vancouver International Airport, from where they flew straight to Los Angeles. They arrived in the city at 3.55am. They never performed “I Want To Hold Your Hand” at this concert. The bootleg recording proves it. It wasn’t known exactly why, but there was crowd trouble so maybe they lost track of the running order? Thanks for the info. The list of songs was the standard one used during the tour, but I guess there were minor variations from show to show. I’m surprised they didn’t do IWTHYH though – the crowds would have loved it. I was there… by an improbable connection between a father who bought 3 tickets for himself, his wife and daughter. The wife backed out, the dad knew my father and asked if I would like to go. I was 11 and already locked in as a lifetime fan. We traveled from Vernon BC to Vancouver to watch. I remember good chunks of the concerts. It was one of the biggest down moments of my life. I could not afford to go see them and I lived in Vancouver. Yes there was trouble at the concert. At one time there were about 12 security guards trying to stop hundreds of fans from breaking in through the main gate. Finally help arrived or it could have been a huge disaster. This is apparently a press conference from Vancouver. Sounds like their flight was turned back shortly before it arrived in Vancouver and they ended up making the journey twice. I lived on Vancouver Island at the time. Radio station CKNW broadcast the show from Empire Stadium but only snippets of the songs were audible. I have a 2-disc vinyl bootleg of the CKNW blow-by-blow account of the day, including the press conference and an interview with the boy who served the Fab Four hamburgers. Safety issues caused a halt in proceedings part way through. Local radio personality Red Robinson did his best to calm things down. The veteran radio reporters and Vancouver Sun entertainment writer were dismayed by the sight of girls fainting and having to be carried off to First Aid treatment. US journalist Larry Kane (author of Ticket To Ride) described the Vancouver concert as one of the most unruly of the entire 1964 tour. I have digitized the whole album and included the contents on my YouTube tribute page. . Does anyone else but me remember the extremely negative coverage of the Beatles’ visit by the local media, including a follow up documentary on CHAN TV, I believe it was called something like “The Beatles, yeah yeah yeah”, and the song “Money’ playing during it, which wasn’t even performed at the concert? The performance itself wasn’t broadcast. What was could best be described as radio men covering what was happening at the concert, with the Beatles singing in the background, and CKNW only tuning in live every now and then. The late Jack Cullen told me he recorded the concert by placing a tape recorder under the stage. Had security known about it, it would have been removed, because Brian “Eppy” Epstein (the group’s manager) was very fussy about there being no illegal recordings made. Cullen eventually put together a two LP set. It contained the concert live, the funny press conference, the aforementioned bits of sporadic live coverage of the event, as well as the Fab Four’s drive into Vancouver, from having landed inconspicuously at a Royal Canadian Air Force base. Cullen also told me that EMI/Capitol visited the record stores selling his double LP, and threatened to stop selling them any Capitol/EMI product unless all sales of the double LP set ceased immediately. How Cullen thought that he could have got away with releasing such a product, so illegal at so many levels, is beyond me. I suppose they were more innocent times. However, it is thanks to Jack Cullen that the Fab Four’s visit to Vancouver was preserved for posterity on audio tape. It is from his two LP set that all bootlegs of the Vancouver concert emanate. One of the few shows they did on this tour wearing their light grey suits instead of the black set. I did not know about Jack Cullen’s involvement and his early live bootleg. It sounds more like he tapped into the stadium sound system rather than set up a tape deck under the stage. The radio clips of the DJs talking about the Beatles, the press conference, the play-by-play of the concert from the sports broadcast booth, the concert itself in great quality and without too much audience noise was a great package. Too bad some of the vocals are flubbed (If I Fell). This was “The Night Before” their first Hollywood Bowl concert. I think IWTHYH was dropped from the set list because of the interruptions to warn the crowd to settle down. I Want to Hold your Hand wasn’t performed more or less for the reasons mentioned in comments above this one. It definitely was to do with the unruly crowd. John once nailed it quite specifically by saying that if The Beatles “didn’t like you”, they would cut a song from the set so as to get out of the venue as soon as possible.